SyncGuardian is a freeware developped by CopyTrans to protect your iPod music content (songs and music data such as playlists, ratings, playcount, etc. ) by preventing iTunes from unwanted synchronization / wipe thanks to its ability to easily set your iPod in manual or automatic update mode. 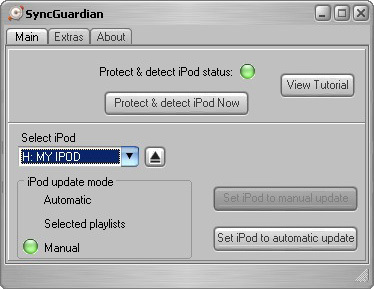 With SyncGuardian, your iPod will never be accidentally wiped anymore. Qweas is providing links to SyncGuardian 1.45 as a courtesy, and makes no representations regarding SyncGuardian or any other applications or any information related thereto. Any questions, complaints or claims regarding this application SyncGuardian 1.45 must be directed to the appropriate software vendor. You may click the publisher link of SyncGuardian on the top of this page to get more details about the vendor.